The United States Congress designated the Aleutian Islands Wilderness (map) in 1980 and it now has a total of 1,300,000 acres. All of this wilderness is located in Alaska and is managed by the Fish and Wildlife Service. The Aleutian Islands consist of more than 200 islands which are actually the peaks of 57 submarine volcanoes (27 of which are considered active) rising from near sea level to more than 9,000 feet. On most of these islands you'll find lush green tundra dotted with summer wildflowers and carpeted with grasses, sedges, mosses, lichens, and heath. Cool average temperatures prevent trees from establishing here. Marine mammals include the endangered Steller sea lion, threatened northern sea otter, and harbor seal. Most of the land mammals, including foxes, reindeer, and caribou, have been introduced by humans. The principal marine fish are halibut, cod, rockfish, sablefish, yellowfin sole, pollack, sand lance, herring, and salmon. In addition to these species, the Aleutians are best known for their birds. More than 10 million nest on the islands each summer. Puffins, auklets, gulls, storm petrels, cormorants, terns, kittiwakes, murres, pigeon guillemots, and murrelets are among the most abundant species. The largest known colony of northern fulmars in America--topping one-half million--nest on Chagulak Island. Half of the world's emperor geese spend their winters in the Aleutians. Once endangered with extinction, the Aleutian cackling goose is now considered recovered and continues to re-colonize former nesting islands. Nowhere else in North America can you find whooper swans, tufted ducks, Siberian ruby-throats, wood sandpipers, far eastern curlews, and black-headed gulls. The Aleut people originally settled on these islands as early as 9,000 years ago. Living off a land poor in sunlight but rich in food, they built seacoast villages and gave Alaska its name: "the Great Land." At their peak population, they numbered somewhere between 15,000 and 25,000. After the Russians arrived in 1741, the Aleuts were decimated first by violent attacks and enslavement, and later by disease. By 1831 fewer than 1,000 Aleuts survived, and today their villages exist only on several of the islands. Japan invaded the Aleutians during World War II, and there are many abandoned military installations and war refuse including unexploded ordnance among the islands. The invasion claimed hundreds of lives of U.S. military personnel, and the war was instrumental in Alaska eventually becoming a state. With the passing of cold war tensions with the Soviet Union, military presence in the Aleutians has declined. The Aleutian Islands Unit is divided into seven island groups: Near Islands, Rat Islands, Delarof Islands, Andreanof Islands, Islands of Four Mountains, Fox Islands, and Krenitzin Islands. Over 57 percent is designated Wilderness. The major Wilderness islands include all or part of the Near Islands of Attu, Agattu, Alaid, Nizki; all or part of the Rat Islands of Buldir, Kiska, Sobaka Rock, Little Kiska, Tanadak, Segula, Khvostof, Pyramid, Davidof, Rat, Little Sitkin, Amchitka, Bird Rock, Semisopochnoi; all or part of the Delarof Islands of Amatignak, Tanadak, Ulak, Unalga, Dinkum Rocks, Kavalga, Gareloi, Ogliuga, Skagul, Tag, Ilak, Gramp Rock; all or part of the Andreanof Islands of Tanaga, Kanaga, Bobrof, Ringgold, Staten, Argonne, Dora, North, South, Green, Ina, Crone, Elf, the island north of Elf, Adak including all offshore islands, Kagalaska, Little Tanaga, Chisak, Umak, Aziak, Tanaklak, Asuksak, Kanu, Tagadak, Great Sitkin, Igitkin, Anagaksik, Ulak, Chugul, Tagalak, Ikiginak, Oglodak, Kasatochi, Salt, Atka, Amlia, Sagagik, Tanadak, Agligadak, Seguam; all or part of the Islands of Four Mountains of Amukta, Chugulak, Yunaska, Herbert, Carlisle, Chuginadak, Uliaga, Kagamil; all or part of the Fox Islands of Vsevidof, Kigul, Ogchul, Pustoi, Emerald, Buck, Ogangen, Egg; all or part of the Krenitzin Islands of Avatanak, Kaligagan, Ugamak, Amak, and Sealion Rocks. In the Aleutians, you will find what may be the foggiest, rainiest, windiest weather in the United States. Temperatures range from average lows of -4 F and below in winter to average highs of 55 F in summer. Sea kayaking is popular but often dangerous due to violent storms and magnificently rocky shorelines. Many of the larger islands offer open country for backpacking including Attu, Agattu, Kiska, Semisopochnoi, Tanaga, Kanaga, Adak, Kagalaska, Great Sitkin, Atka, Amlia, and Seguam. Storms are continuous, but the persistent may find visiting the islands to be the Wilderness experience of a lifetime. 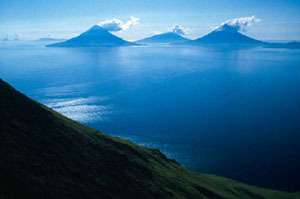 Planning to Visit the Aleutian Islands Wilderness? How to follow the seven standard Leave No Trace principles differs in different parts of the country (desert vs. Rocky Mountains). Click on any of the principles listed below to learn more about how they apply in the Aleutian Islands Wilderness.